There is a place that is not the earth and not the sky, an in-between place where some of us ride the fray. ← A Recipe for Patience. How lovely Anna! BTW I used one of your quotes in the anniversary book I just did for my husband. The one about living life so when you age your partner can still see you dance. I just loved that thought! I’m flattered! Thank you, Tina. And Happy Anniversary, what a great gift. 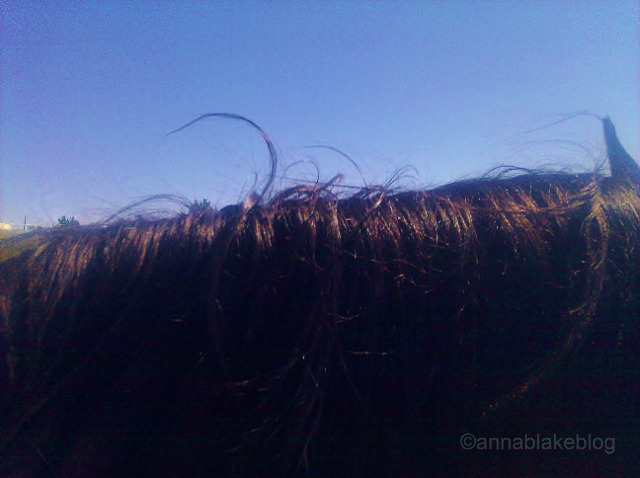 The best view in the world is straight through my horse’s ears. Hardly matters what I’m seeing, so long as it’s framed by his pinnae. What peace! Beautiful poetry for my yucky Monday! Till I escape again to the farm! My first instructor always said, “Take a deep seat and a faraway look.” Seems to work in the saddle or out. Have a good week.